As Emily looked down at the blood seeping through Jewels fingers, she felt like it was her that had been shoot. Jewels had become a huge part of their small family over the last year. Besides becoming her father’s lover, the former EMT had all but adapted Emily and her younger brother. Emily looked over at her father as her silent tears mixed with the blood below. “No waiting. You’re in charge, Em, I’m going to try to lead him away or at least flush him out.” Then, without another word, he rushed off into the desert chaparral. “Oh no, oh no, oh no,” she began to chant like a mantra. Emily struggled to control her breathing as Jewels moved her hands so they covered her wound better. Emily jerked when shots rang out. They didn’t come from her father’s gun. She feared the worse, but then heard her father return fire and hoped that was a good thing. Emily looked over while horror froze her face. A zombie had Spencer by the hair and was pulling him back into a cluster of wait-a-minute bushes. 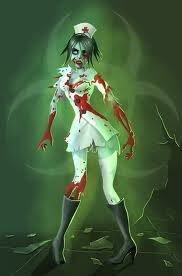 But Emily had bigger problems because two more zombies had emerged behind the first one. The shot rang out and the zombie fell away. Spence wasted no time getting on his hands and knees. He was about to crawl for her, but then headed back toward the other two zombies. In her panic, she missed with the first shot. Spencer’s wide eyes met hers somehow as he snatched up the fallen bandages. She nodded, aimed, and put a bullet through the center of the next one’s skull. The last one she dropped with just one shot. “I am getting better at this.” Thanks dad. After scanning the area for more zombies, she dropped down, joining Spencer near Jewels. In the distance, she heard more shooting, but it seemed further away. Much closer at hand, more zombies could be heard moving up the hill. Emily led the way into the alley. Spencer stayed close to her heels, but Sarah flailed her arms in panic. Already, the first bloody form that had toppled over the fence behind them was gaining its unsteady feet and jerking toward them like a drunken stilt walker. Her eyes gazed up and down the alley. For once, the Goddess had thrown some luck their way and the single track pathway appeared clear of the maniacs that ravaged their city. She took a step forward holding the short shovel before her. Spencer’s small hands held his bat and he hovered so close that he could have been her shadow. They were still a long way from home, but she started east and the others were quick to follow. Sarah still seemed on the verge of having a panic attack, but the moaning half-men stumbling through the yard toward them, gave her little choice but to follow her friends. Before long, the alley spilled into a paved street. The sounds of screaming in the distance could be heard. Three of the things lurched toward the direction of the scream. The trio clung to the bushes and waited for them to pass. In a few moments, the street before them would be clear, but a half-dozen of the things that had seen them in front of Sarah’s house forced their way into the alley behind them. As the three in front slowly trudged by, the ones behind drew ever nearer. Sarah grabbed her arm and Emily struggled to keep her friend hidden while the moaning grew louder. The foul sounds filled her young ears. It felt unnatural. Wrong. The scent of death lingered. These things aren’t alive. The thought came from nowhere and screamed inside of her head. The foul bloody moaners behind her were thirty feet away. The last of the madmen passed by the alley. Emily pushed her brother before her, grabbed Sarah’s hand, and then ran. The stumbling freaks that had just passed them turned at the sound of their movement and with louder groans joined the ones moving behind them in the chase. The next street was Euclid—A wide five lane street. Three of the things, which were becoming all too common, surrounded an ambulance that had tipped onto its side. Two people perched on top of the vehicle fought back against the bloody hands that grasped at them. The road itself was a mix of staled cars and crashed vehicles. Figures ran through the chaotic mess, but between the dust, sunlight, and smoke Emily could barely tell who chased after who. Spencer stared opened mouthed. Emily looked at the women and then the ambulance. Two of the mangled figures had heard the woman and broken away. But it was the two things that walked out of the rolling coils of smoke that neared first. Emily didn’t have a chance to warn the women before two sets of hands pulled her back. The older women lost her balance and went down. Almost at once, she screamed. Emily looked on in complete horror and fingers and teeth dug into the old woman’s body. The world had gone mad. The other two joined the pulling and tearing of flesh. Spencer and Sarah remained in shock, but Emily felt responsible. It was her duty to save her little brother and her damaged friend. And that was when the moaning woman grabbed her hair. Emily cried out as she was pulled back away from her brother and best friend. 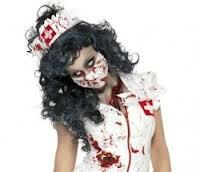 Behind her, she caught a glimpse of a woman wearing blood splattered nurse scrubs. She heard more moaning that she knew it came from the ones pursuing them. Terror tore into Emily as the nurse’s teeth snapped inches from her face. The blood splashed woman dragged her back into the alley. Emily struggled to push her back with her shovel and again teeth snapped inched from her face. Spencer’s bat smashed the drooling woman in the cheek and her head jerked back. It wasn’t a conscious movement. Later she wouldn’t even remember it happening, but the shovel came up and hit the snarling nurse under the nose. It fell back, but still had a grip on her shirt. Using both hands, she swung with all her twelve-year old might. The thing lost its grip on her as it toppled back. When it got back up a third time, her shovel came down like an axe. She wasn’t sure where this last blow came from, but for once the thing didn’t regain its footing and behaved like a dead body should. Spencer had been throwing rocks at the form of the hollowed out man that couldn’t possibly be alive. More of these things lumbered in from every direction. How could there be so many, so fast? Some of the moaners broke away from the woman’s unmoving corpse, looking for the fresh kill. Emily dragged Sarah along. They hurried to stay ahead of the gathering horde. The couple on the overturned ambulance appeared by their side. The women grabbed Sarah’s hand and dragged her along. The man, maybe twice Emily’s age led the way east and smashed one of the bleeding men in the face with a crowbar. It didn’t get back up. Emily and her brother shared one last look at the growing masses of dead things and then hurried after the others.